The introduction of direct-acting antiviral agents (DAAs) has made hepatitis C infection curable in the vast majority of cases and the elimination of the disease possible. Although initially too costly for large-scale use, recent reductions in prices in some low-and-middle-income countries (LaMICs) has improved the prospect of many people having access to it in the future. This paper assesses the pricing and financing conditions under which the uptake of HCV drugs can increase to the point where the elimination of the disease in LaMICs is feasible. A Markov simulation model is used to study the dynamics of the infection with the introduction of treatment over a 10-year period. 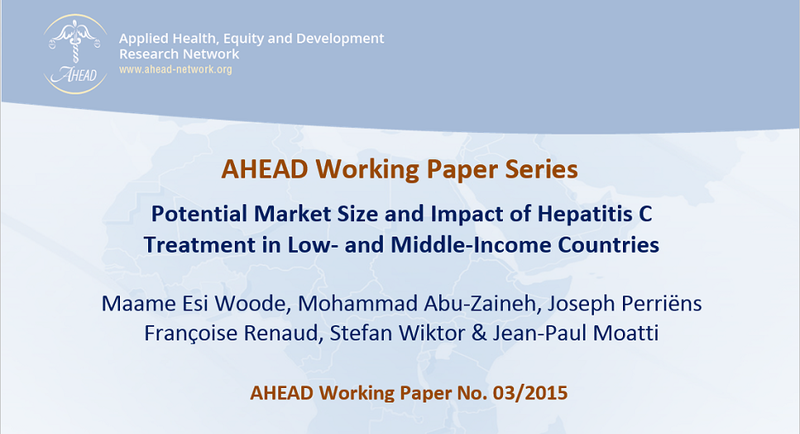 Impact on HCV-related mortality and HCV incidence is assessed under different financing scenarios assuming that the cost of the drugs is either paid for out-of-pocket, or reduced through either subsidy or drug price decreases, and different diagnostic and service delivery capacity scenarios separately for low-income (LIC), lower-middle-income (LMIC), and upper-middle-income countries (UMIC). Monte-Carlo simulations are used for sensitivity analyses. At a price of US$ 1680 per 12-week treatment (based on negotiated Egyptian prices for an all oral two-DAA regimen), most of the infected in LICs and LMICs are predicted to have limited access to treatment without subsidy or significant price decreases for the drugs, but people in UMICs would be able to access it without subsidy. However, for HCV treatment to have a significant impact on mortality and incidence, significant scale-up of diagnostic and service delivery capacity for HCV infection is needed.